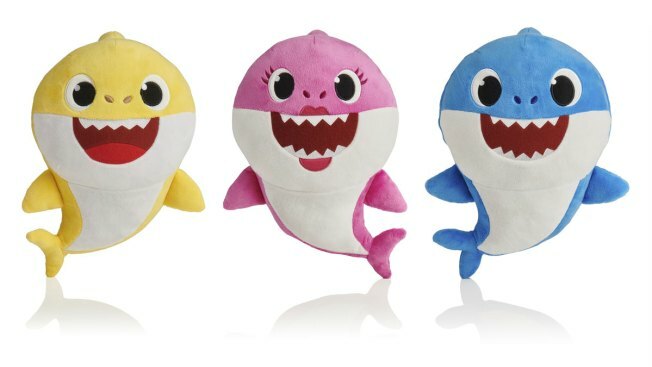 This picture shows the WowWee pinkfong Baby Shark family of singing plush toys. The viral song and its kiddie music videos have entranced toddlers and parents alike, though some of the grown-ups are now suffering from shark fatigue. "Baby Shark," a catchy children's song, has taken a bite out of the Billboard Hot 100 list. The song entered the Billboard chart at No. 32 for the week of Jan. 12. The song has its continued streaming growth to thank for its landing at that spot, Billboard said. "'Baby Shark,' whose origins date back decades, is a participatory children's song/nursery rhyme in which singers act out each verse with their hands and arms, from the eponymous youngest member of a family to the parents and grandparents," Billboard said. Pinkfong, a South Korea-based educational brand, released its version of the song in 2016 and a subsequent video that led to the track becoming a meme, Billboard said. "Baby Shark," which Pinkfong says it based on a “traditional singalong chant,” was streamed 20.8 million times for the week ending Jan. 3, with 73 percent of those streams coming from video, Billboard said.